The company in this case study makes whiskey, beer, and wine, as well as foodstuffs and medicines. DCS and SCADA systems – some new, and some legacy – are used in the various processes. The company upgraded the winemaking plant to a DCS-based batch control system in 1996, and upgrading to a system based on ISA SP88 – which has been followed for several years – has just been completed. This case study describes a PC-based blending system, which integrates a front-end scheduler with SCADA and batch software packages, just installed in a new factory at Takasago. The slogan for the new factory and distribution center, just completed on the 11th November, is "An environment-friendly factory for the 21st Century". It uses the latest automation, control, and computer equipment, for flexible and efficient soft drink production and distribution. It was designed to meet a variety of consumer needs, and is the main site in West Japan (serving Kansai, Chugoku and Shikoku areas). The design concepts of this "advanced factory for the 21st century" included high product quality, environmental considerations – it was designed, based on ISO 14000, with the target of realizing zero emissions and preserving the environment to the maximum possible extent – and harmony with the surrounding landscape and community. Environmental considerations included reduction of discharged waste, liquids, and emitted gases, and recycling. Water consumption per unit of product is less than half that of earlier plants. In addition, solar and wind power generation is being developed. The design follows ISA-S88.01 closely. Both physical and procedure models for the blending process follow the ISA S88 model. 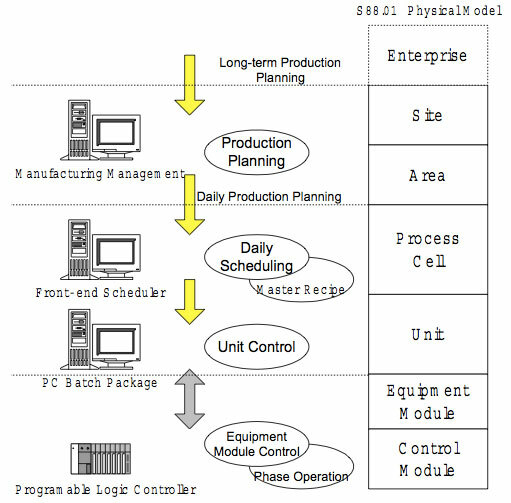 A hierarchical system is used: the phase parts use PLCs controlled by a PC- resident batch package, based on ISA S88.01, with unit management functions (refer to Figure 1). Having about 30,000 tags, this is probably the largest PC-resident, ISA S88.01 based, batch system in the world. To meet and follow a variety of consumer needs, frequent recipe changes and new products are required; the adoption of ISA S88 makes it easy to add or change recipe definition data, and change system configuration. The integrated front-end scheduler doesn't just schedule blending, it also provides various peripheral operation support functions: the operators are provided with real-time production status overview, so they can operate more efficiently, increasing productivity. The configuration realizes "flexible production", "efficient, optimized operation" and "consistent product quality". Details of the front-end scheduler are described below. The function of managing batch progress, in conjunction with the batch control system, and performing rescheduling where necessary, is called "Front End Scheduling", and our Front End Scheduler is described here. 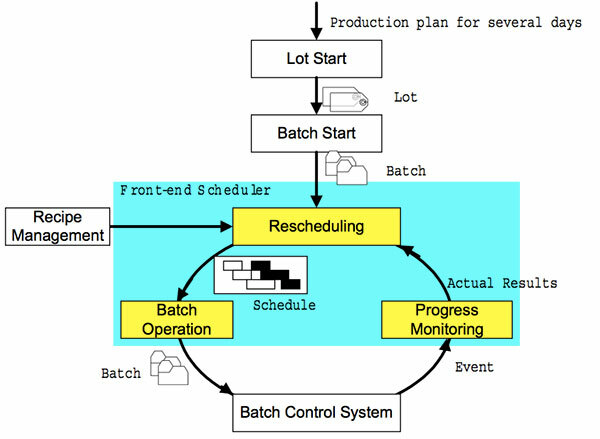 The main functions–Progress Monitoring, Rescheduling, and Batch Operation–are illustrated in Figure 2. The vertical axis shows different units, and the horizontal axis shows time, the large triangle shows current time (to the left of it is the past, and to the right of it is the future). For each batch, the production time target and the results (actual production time) can be compared. In the figure, we can see that the process stage of B0109 started a little late and finished further behind schedule. Rescheduling is explained by the example shown in Figure 3. First a schedule is created, as shown by the upper Gantt chart. 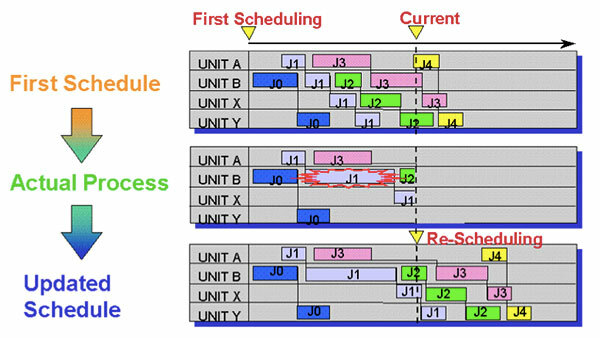 Now suppose that batch J1, the process stage of Unit B, does not proceed according to schedule, as shown by "Actual Process" in the middle Gantt chart of the figure. As a result, batches J2, J3 ... cannot finish according to schedule. So a possible "Updated Schedule" is produced, as shown in the lower Gantt chart. Here the following batches are just started later, but – depending on batch execution priority – it is also feasible to change the order of execution. Urgent batches, or new batches which have been assigned by supervisory planning system, are (re)scheduled at this stage. Batches consist of master recipe name, production quantity, and "latest date due". The front-end scheduler retrieves the corresponding master recipe from the recipe management functions, then assigns units and production target date / time. In batch industries, where recipe changes may occur frequently, easy management of batch definition data is very important. In general, the definition of schedule data requires specialist knowledge, and the workload is heavy, so the work is difficult. A scheduling specialist is required because not only system reconfiguration but also recipe changes and new recipes may be needed. When connecting scheduler and batch control system, it has to be decided what information will be transmitted to the batch control system, whether batches will be controlled one by one, and how about master recipes – many problems must be solved. When recipe definition data is changed, synchronizing scheduler and batch system could be a big job. Since the Front-end Scheduler and batch control system are tightly linked, there's a one to one correspondence between scheduler and batch control system for batches and for recipes. No thought is required. No manual synchronization of data is required. Anyone who can understand batch control system definition data can easily add batch definition data to the front-end scheduler – specialist knowledge is not required. 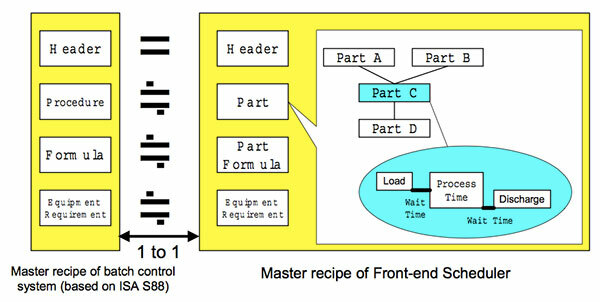 Ideally, the batch control system definition data should be sufficient to operate the front-end scheduler. However there are inevitable differences between recipes for batch control and recipes for scheduler, which are not easy to resolve. Here we describe the problems and how they are resolved. The header can be used "as is". The procedure is handled as described below. In general, the control and scheduling representations are different. 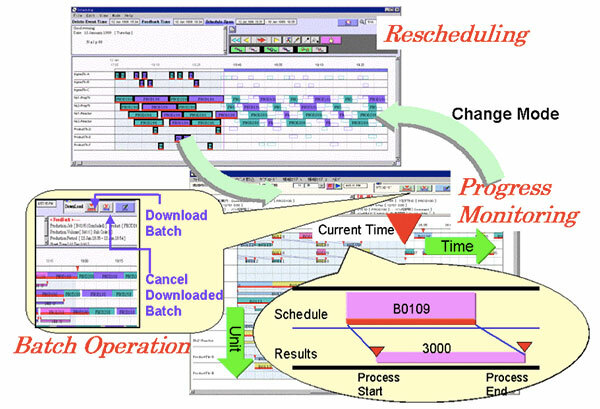 In the system in this case study, in order to display phase-level production progress, a procedure (containing operations and phases) in the batch master recipe is represented by parts (corresponding to the phases) in the scheduler master recipe. A Sequential Function Chart (SFC) can perform phases conditionally depending on results of a reaction: if quality is satisfactory then phase A is executed, otherwise phase B is executed. The phases to be executed and their order is not fixed. The normal phase order is used in scheduling. For scheduling, "when product is transferred between units, the timing of the discharge stage of the preceding unit procedure and the loading stage of the following unit procedure must be synchronized", and "when the following unit is busy with another batch, the preceding unit must wait until it is ready" must be realized. As shown in Figure 4,5 these procedures are represented by parts. Parts represent loading time, process time, and discharge time, so that the discharge time of the preceding part and the loading time of the following part may be synchronized. Also, as required, wait time may be added between loading and process time and between process time and output. The formulas used in batch control master recipes and the formulas used in scheduler master recipes differ, but their basic structure can be the same. For the scheduler master recipe, processing time information and the like needs to be added. Equipment requirements for batch system and scheduler are equivalent if batch procedure and scheduler part are equivalent. System Structure In this example, the system configuration was as shown in Figure 6. From the quantity to be produced over several days, this step decides how many lots to produce and the optimum lot scheduling. The production capacity of the physical model decides the size of each batch, which is the production unit. The latest date due for each lot is assigned to the batches which make up the lot. 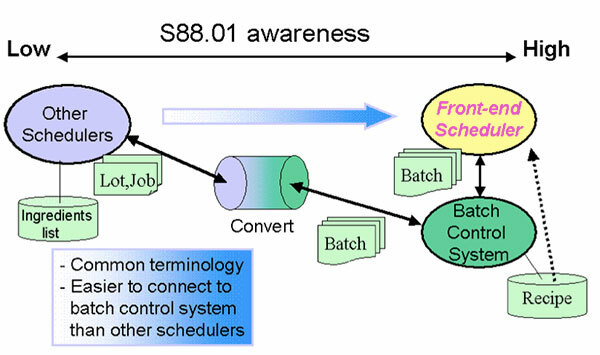 A commercial batch control system based on ISA S88 is used to manage batch operation. Since the system is based on ISA S88, the interface between parts of the system is simple, initial system configuration is simplified, tuning can be expected to be reduced, and adding or changing of recipes simplified. As a result, it should be easy to quickly respond to consumer needs. While previous systems required specialist knowledge to set scheduler definition data, with this new system anyone who can understand the batch control system definition data can easily add front-end scheduler data – no specialist knowledge is required. By making it easier to reschedule, optimal factory operation and enhanced productivity have been realized. As a result, stable production and consistent product quality have been achieved.